Dale Koppel has been writing since 1987 and is author of "The Intelligent Woman's Guide to Online Dating." Her work has appeared in the "Boston Globe," "Miami Herald," "Los Angeles Times" and "Redbook." Koppel has a B.S. in journalism from Boston University, an M.A. in educational psychology from Columbia University and a Ph.D. in curriculum/instruction from University of New Mexico. There are two types of back braces. Rigid back braces immobilize the muscular and bony structure of the spine. Soft elastic braces, also known as lumbar corsets, are designed to support the spine. Back braces are a valuable resource for people who have had back surgery, suffer from back pain as a result of an ongoing medical condition or a temporary injury, or do heavy lifting. Braces, however, have risks if you do not use them properly. Excessive and continuous use of a back brace, except in extreme cases and only when advised by a medical specialist, can weaken lumbar muscles. Specialists at the Colorado Comprehensive Spine Institute do not recommend continuous use. Instead, they suggest task-specific use. They say, "This means that when an individual is involved in an act that places their back at risk, the brace should be employed. When this 'at risk' activity is finished, the brace should be removed." You can do more damage to your back if you do not choose the correct back brace. Even lumbar support braces come in a wide variety. If you need lower back support, choose a lumbar support brace. If you need support for your lower back and the upper buttocks area, choose a lumbar sacral support brace. Adults and children who have been diagnosed with scoliosis, the unhealthy curvature or a normally straight spine, need to find a back brace that is designed specifically for scoliosis sufferers. The reason for a back brace is also an important consideration. You may need to restrict movement, or you may need to ameliorate pain without restricting movement. When you restrict movement too much, you can adversely affect quality of life, which, in turn, can have an impact on recovery. According to the Colorado Comprehensive Spine Institute, a brace is "little more than a stop gap measure." An essential element to the health of your back is engaging in lumbar strengthening exercises on a regular basis. In extreme or prolonged cases, finding a professional physical therapist may be required. It is always important to consult a medical professional if back pain persists. 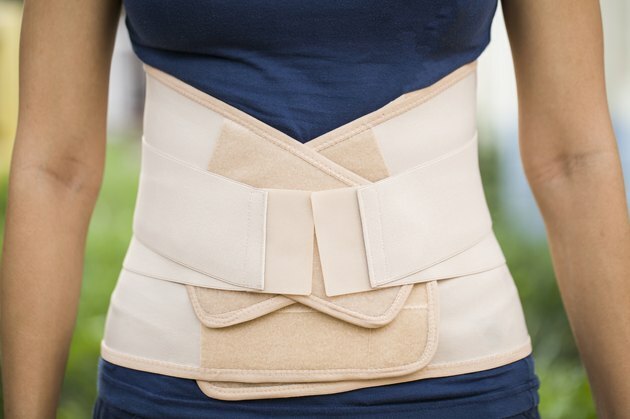 In these cases, the use of a back brace can worsen the problem. Researchers from the UCLA School of Public Health conducted a study on the workplace injury history of 36,000 workers at The Home Depot over a six-year period. They found that injuries fell by approximately 33 percent after a consistent policy on back support use had been adopted. However, without worker training and the proper workplace ergonomic design, there is heightened risk of back injury. People put themselves at greater risk in the workplace if they wear a back brace as a way to ignore proper heavy lifting procedures. Is a Weighted Vest Bad for Your Back?